The peppy porker hams it up in the minute-long ad below, deftly dodging downtown traffic before falling into the hands of some curious kids and breaking apart on the sidewalk in a geyser of small change. Luckily, there’s a Santander banker nearby, who takes the unfortunate oinker home for some much-needed kindness and repairs. In the most unexpected surprise ending of all time, ol’ soft-hearted banksy ultimately deposits his porcine pal back with its rightful owners. The dual nature of the pig as bank and pet could have been confusing, but Rattling Stick director Daniel Kleinman really brings home the bacon. He stays on-message through shrewd storytelling and lets viewers draw whatever conclusions they like. Besides, leaving things a bit ambiguous gives the story an extra fantastical kick. 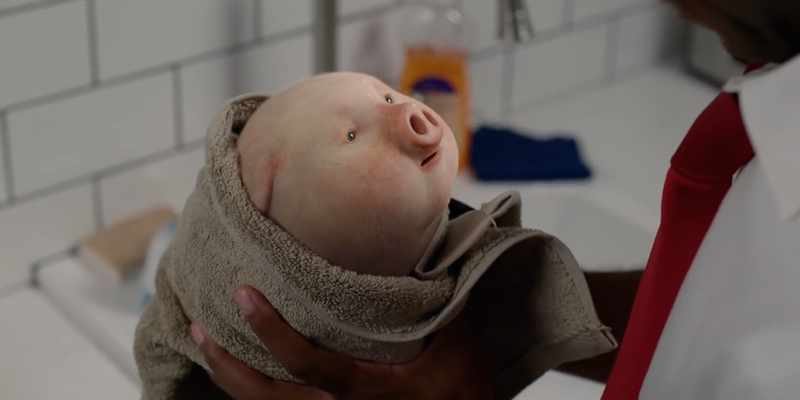 In a secondary flight of ads with similar brand themes, Arnold and Hungry Man director Hank Perlman pig out on broad visual puns to explain that the Santander doesn’t “shaft,” “fleece” or “hose” its customers. As for competing banks, well, they might just give you Jack Squat (in a lavender muscle-shirt and headband, doing squats in your driveway).